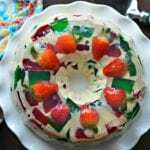 Inside: Keep reading to find out how to make the most delicious Mexican Mosaic Gelatin (Gelatina de Mosaico) recipe which is popular with people of all ages! Mexican mosaic gelatin (gelatina de mosaico) is very popular in Mexico. You can find this easy to make dessert from street vendors and at fancy restaurants in Mexico. It is easily recognizable for its distinctive colors and sweet and exquisite flavors which will have you coming back for more. Even though mosaic gelatin is easy and inexpensive to make, it looks so amazing that people will think you spent hours decorating it! Trust me that this will be popular no matter where you take it! As a personal anecdote, it is interesting to remember that unlike in the United States, in Mexico government financial aid for students is practically non-existent. Because of that many families are unable to pay for their children to study past high school. As a result, children often have to look for opportunities to help out in one way or another to help cover educational expenses. Another obstacle is that there are not very many part-time jobs available, so it is necessary to look for creative ways to make some money. I was one of those students in Mexico that had to fight to receive an education and I am proud to say that I was able to obtain my degree in business administration. One of the things that I did to help pay for my studies was to make this mosaic gelatin at home and sell it to people around my neighborhood. With time, I got better at making it and was able to obtain many customers! So now, I am able to share some tips and tricks to make a perfect mosaic gelatin. What is Mosaic Gelatin (Gelatina de Mosaico)? Mosaic gelatin really is nothing more than multiple colors of prepared gelatin, which is then mixed with a sweet, creamy gelatin made with sweetened condensed milk and unflavored gelatin. It is sweet and creamy and you can make it with whatever colors and flavors you prefer. In Mexico, the most common flavors are lime and strawberry, which combined with the sweetened condensed milk gelatin, reflects the colors of the Mexican flag. Of course you can also use grape, pineapple, orange, or really any other flavor and color combination that you want. To make the recipe, you will start by preparing the different flavors and colors of gelatin separately and then cutting them into cubes once they are completely firm. After doing that you, will combine them in a large bowl so that the colors are evenly distributed. This is such a versatile recipe that can be modified depending on the occasion that you are celebrating. For example, here in the United States it would be great to make it with red, white and blue colors for the 4th of July or memorial day. 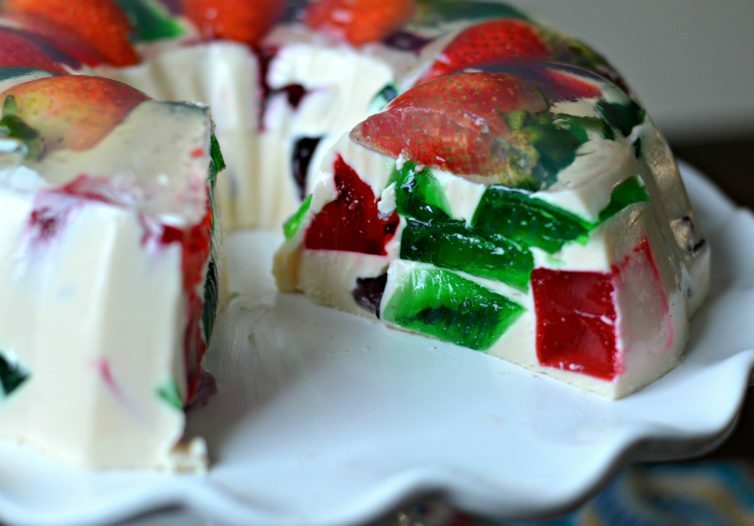 I also like to add a layer of clear gelatin on the bottom so that I can add fresh fruit as a decoration. If you do this step (which is optional), you prepare the gelatin in the bundt pan first and let it set before adding the rest. Many people don’t include this step, but I think it makes it look even nicer and professionally done. I hope that you try this recipe and let me know how it turns out! 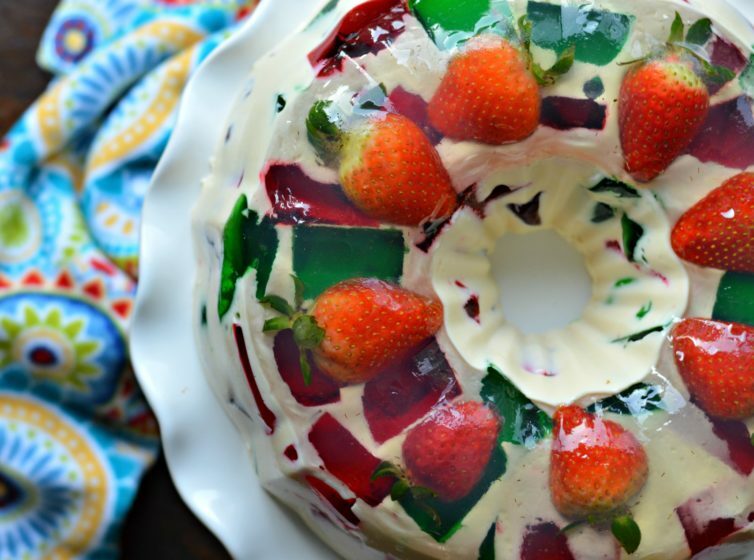 Keep reading to find out how to make the most delicious Mexican Mosaic Gelatin (Gelatina de Mosaico) recipe which is popular with people of all ages! Prepare the flavored gelatin according to the package instructions and refrigerate until they are very firm. 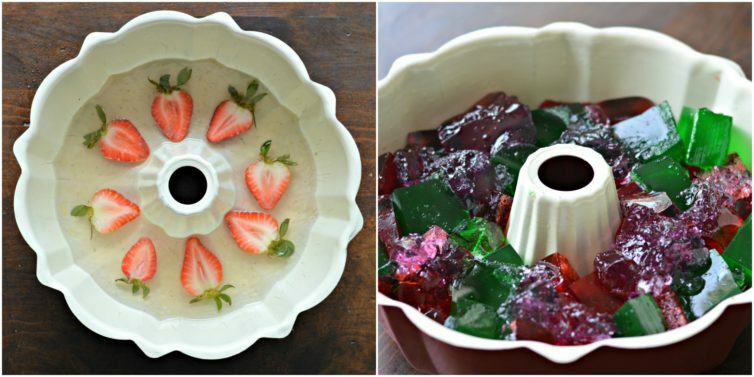 Once completely firm, cut the flavored gelatin into cubes and combine in a large bowl. 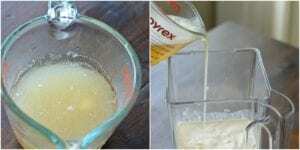 For the clear layer, dissolve the unflavored gelatin with 3/4 cup of hot water, 1/2 cup of cold water, and the sugar and mix well until everything is combined. Add this mixture to the bottom of a pre-greased bundt pan, and add fruit of your choice. 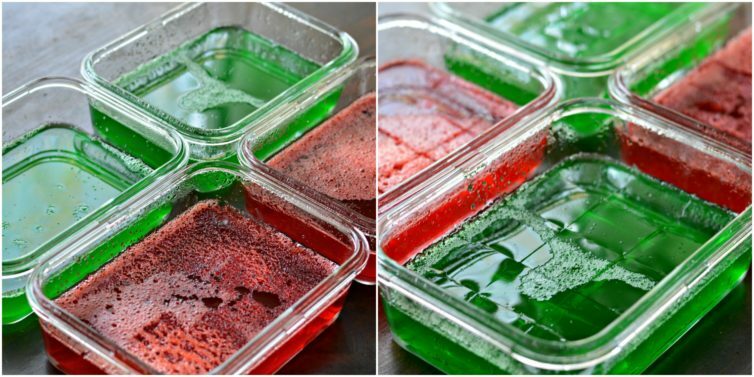 Refrigerate for at least 20 minutes, or until firm enough to add the cubes of prepared gelatin on top. Separately, add 28 grams of unflavored gelatin to 1/2 cup of water, stir and let sit for about 10 minutes until it looks like the picture below. At that point, put it in the microwave for 35 seconds until it is in liquid form again. Add the above mixture to a blender with the evaporated milk, sweetened condensed milk, and table cream and blend until everything is combed. 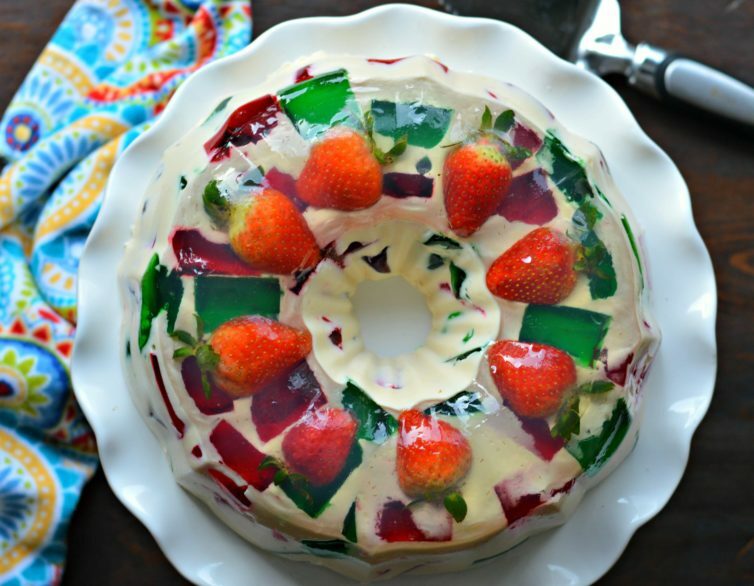 Pour the milk gelatin mixture into the bundt pan covering the flavored gelatin cubes completely. Refrigerate for about 3 hours and serve right away with fresh whipped cream. « Deliciosa Gelatina de Mosaico!